Hornet baseball falls to Mansfield, 13-1. Hornet baseball falls to Canton, 7-2. JV baseball falls to Troy. JV baseball falls, ties with Canton. Mansfield walks off with win over Wellsboro. Simmons strikes out a record 17 in Tioga's win. 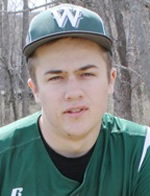 Athens edges Waverly; Canton edges Wellsboro in extra innings. Athens tops Towanda; Canton, Wellsboro win out West. Tioga holds on over Edison.